“You can talk in a grand fashion about a 20-year plan, but you also have to work on what ‘this afternoon’ brings. 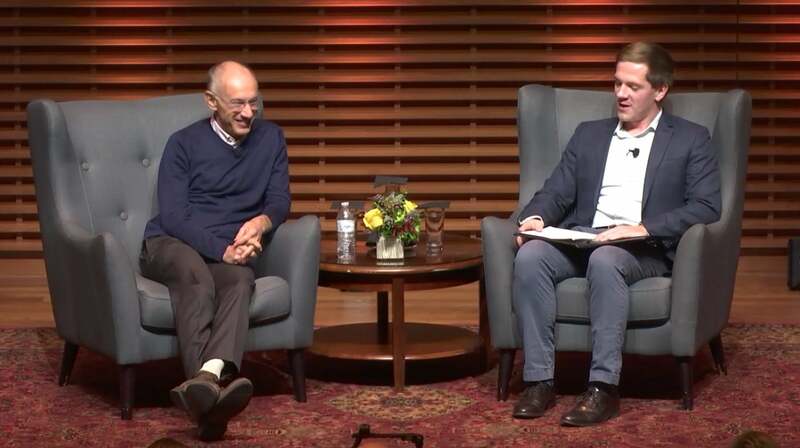 Having a sense of where your compass is set, and then breaking it down into little steps – knowing they will change over time, but not losing sight – that’s what you need to build an organization.” Michael Moritz, partner at Sequoia Capital, visited campus for View From The Top and shared what he learned as a journalist covering Silicon Valley in the 1980’s and later as an investor within it. You've clearly had a very impressive career but before becoming one of them. That's not what my mother says. Before becoming one of the top venture capitalists in the world being knighted by the Queen. You were a boy from Wales. What did you want to be when you grow up. I actually.. Not this game or sport is played in America. And so it didn't translate I wanted to be a cricket player. A cricketer. But I was a coward and the ball was very very hot and so I spent most of my time in sport whether it was cricket or rugby trying to avoid being anywhere near the ball so. I have a friend actually who became a spectacular rugby player who played for Wales which. And I told him that the only thing that separated him and me on the rugby field was when he took to the field he wanted the ball to come in his direction. And I of course want to do the reverse I never wanted to see it come in my direction. So but as I got a bit older I became interested in journalism and when I was at Oxford I knew that I wanted to be a gymnast when I was a Dong's so I'm interested in the story of how your family came to Wales. It was quite inspiring that your parents actually escaped Germany during the Second World War arriving in Wales as refugees in the UK as refugees. How did their struggles and their experience shape you early on sort of what you wanted to do with your life. Well they were very lucky they didn't escape during the Second World War they escaped beforehand not many people escaped Germany during the Second World War. And my father left Germany he was born in Munich and went to Britain when he was a 14 year old. My mother went on something called the kinda transport which was 10000 kids from Germany basically that were that were rescued and put in with. In foster homes. And they then met subsequently in Britain and after the war they got married. And you know there's a searing experiences difficult and I'm sure every you know there are people here either who have. Firsthand familial experience of something is disquieting unsettling and wrenching as those sorts of experiences but. Those are the experiences that come down through generations. My father's father. Served in the German Army during World War One. He was decorated and my father's mother was a nurse in the German Army during World War One and then. Both of them were killed. They were murdered by the Nazis. And my father died about 15 16 years ago. My mother. So last week is 95 and still. Vibrant. But. Those experiences they color everything they hang over everything like like a dark cloud. It is always the anxiety and the fear. Of the whole world being ripped out from underneath you and it the colors the way that you live there understandably and that drives you today still Well I don't know about that but it certainly. Had a profound effect on my my parents and they came to Wales. As outsiders and obviously Britain. I owe everything my parents have everything to the fact that Britain opened its borders and. Allowed them to settle there. But it was not easy. They were in a minority that weren't exactly. I mean I was one of I think three Jewish kids at the high school that I went to. So I've always you know one always felt. An outsider in the delineation between religions in Britain which is you know 15 40 50 years ago was very very sharp. And so if you didn't belong to the majority it was very obvious that you were.